Concerned about the marked increase in fireworks related injuries over the past few years, a new charitable foundation has been established to focus on creating fireworks safety education programs for youth, targeting grades K-12. The officers of the American Pyrotechnics Safety & Education Foundation believe it is critical to the success of the foundation to keep its supporters updated on the activities & programs their dollars make possible. To that end, a short, quarterly newsletter entitled Smoke Signals has been created to keep supporters up-to-date on the foundation's latest efforts to promote fireworks safety & education. Auction Success - Thank You! The foundation held its inaugural fundraising event at APA's annual convention in Miami, Florida in early October and the evening was one to remember. 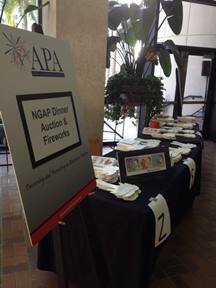 Members of the association's Next Generation APA committee (NGAP) organized and ran the activities which included a wine toss, spa raffle and dessert dash -- all designed to raise cash for the foundation. Auctioneer extraordinaire Chester Davis took bids from the over 250 people in attendance who enjoyed a fun-filled night capped off by a signature fireworks display by Walt Disney Entertainment. Huge THANKS are extended to all those who helped make the foundation's inaugural event such a resounding success, especially the generous members who donated auction items ranging from a customized fireworks themed guitar to an exclusive Kentucky Derby package. NGAP members, who contributed countless hours planning and executing the evening's festivities, deserve special applause. Most of all, sincere gratitude extended to all those who attended the event, participated in the activities, and bid on the fabulous items. The outpouring of support from APA members has been a tremendous jumpstart for the Foundation and its future accomplishments. 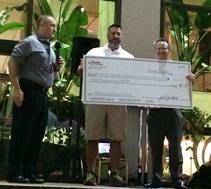 Ryder Truck Rental presents its generous $3,000 donation. We are excited to report that the APSEF Board has approved retaining former Chair of the CPSC Inez Tenenbaum to spearhead the development and distribution of age appropriate curriculum and resources to teach young people more about consumer and display fireworks. The purpose behind this educational effort is to instill in young people an understanding of how fireworks should be used appropriately, discourage misuse, and decrease the number of fireworks related injuries in the U.S. We're excited to have Ms. Tenenbaum, and the expertise & enthusiasm she brings, join the cause of promoting fireworks safety. Read more about Ms. Tenenbaum here. Ron Zoldan, B.J. Alan Co. Please consider lending your support to the new American Pyrotechnics Safety & Education Foundation before the end of the year. A donation form can be accessed here and remember, your contribution is tax deductible!